"I stand upon my desk to remind myself that we must constantly look at things in a different way." - John Keating. Seize the Day- One of the Greatest Movies Ever !! . 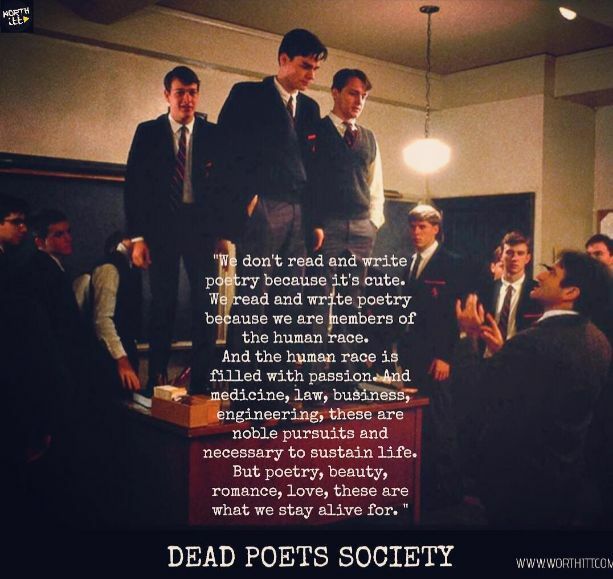 Dead Poets Society is a 1989 American drama film that tells the story of John Keating (Robin Williams), an English teacher who inspires his students through his teaching of poetry and to break free from there normal life and live life unapologetically. . Starring - Robin Williams, Robert Sean Leonard, Ethan Hawke, Josh Charles . The plot, the performances and the message it conveys are so meaningful, sensitive and moving that they stirred within me something deep, something as 'unapologetic' and 'deliberate' as the meetings of the dead poets society. This is a must-see movie, especially if you're a high school student who hates English. It might just change your view of the subject, even if your actual teacher doesn't quite measure up to Mr. Keating.